Through his position as educator, as harpist, and in his capacity as director of orchestral and choral music, Anthony Maydwell has an impressive if unusual reputation. As a child, Anthony Maydwell was a medallist in St Andrew’s Cathedral, Sydney. He began formal piano tuition at 5, taking up the harp at the age of 10. Anthony began playing regularly with the Sydney Symphony Orchestra from the age of 16 with his first recordings and his concerto début for Musica Viva at 17. At 21 he was described as ‘a distinguished Australian musician’ (Sydney Morning Herald). While still studying Anthony Maydwell gained experience in conducting under Robert Pikler and Richard Gill, already experimenting with the rarer parts of the repertoire including Restoration masques and late Renaissance Italian madrigal. In 1975, Anthony was awarded Student of the Year at the NSW State Conservatorium of Music. He was a member of AZ Music, The Seymour Group and regularly played with Opera Australia and Australian Ballet orchestras. After taking up the position as harpist with the West Australian Symphony Orchestra, Anthony Maydwell completed an MA at the University of Western Australia specialising in Trecento Madrigal, and later in 18th century performance practice. Anthony was on staff at the WA Conservatorium of Music from 1986 to 2008. He resigned to focus on his Bolivian work described below. He has toured with the Hallé Orchestra and the Budapest Symphony; conducted first Australian performances of Haydn’s Seven Last Words in both orchestral and oratorio versions as well as conducting Australian premier performances of many composers including Sir Harrison Birtwhistle, Sylvano Bussotti, George Crumb, Debussy, Olivier Messiaen, Arvo Pärt and Gofredo Petrassi. For over a decade Anthony has directed the SUMMA MUSICA Chamber Choir which has won considerable acclaim performing both early and contemporary music, including the first Australian performances of works by Gallus, Gesualdo, Giovanetti, Hakim, Landi, Lassus, Lotti, and Macmillan, to name but a few. Among the highlights of his performing career starting with his first commercial recording aged 16 of Eugene Goosens' Trio for the ABC/World Record Club through to playing harp on the 2006 Naxos/Opus Arte DVD (OAF 4014D) of Britten's Turn of the Screw are but two of many memorable performances. From the beginning of 2000 to 2003 Anthony Maydwell was principal harpist in the Singapore Symphony Orchestra performing in both Singapore and China including harp on a recording of the works of Richard Yardumian by the orchestra on the BIS label. In 2003 Anthony Maydwell completed a new performing edition of Tomas Luis de Victoria's Lamentatio which was performed on Good Friday of that year. He also directed performances of Janequin's Onomatopoeic Chansons (his translation of the text is available at ChoralNet), Debussy's Chansons de Bilitis, Monteverdi's Fourth Book of Madrigals (The previous year he directed a performance of Gesualdo's Fifth Book), and directed the WA Academy of Performing Arts 2003 season of Kurt Weill's Street Scene (A brief review appears in the March 2004 edition of Opera magazine). Performances presented in 2004 included Saint-Saëns/Philip Cannon recital (Harp), Brahms' Requiem (Harp) and directed a performance of Berlioz works for choir and piano and selections from L'enfance du Christ with the Conservatorium Chorale. He also made a 'live' recording for broadcast by the ABC in October. He conducted performances of Handel's Zadok the Priest and Mozart's Coronation Mass in October. He performed on harp, works by Swiss composer F-J Zbinden with flute and Spanish-Cuban composer Morales Caso with viola in late October and early November and conducted SUMMA MUSICA in a performance of works by Pärt, Maxwell Davies and MacMillan in December. In 2004 he completed a new edition of Pomponio Nenna's Responses for Holy Week (selections were performed in May of that year by Collegium Vocale, Ghent). The responses for Maundy Thursday and Good Friday were presented on Good Friday, 2004 while the Wednesday Responses were performed in July 2004. In 2005 he directed a performance of Palestrina's fourth book of Lamentations for Good Friday and music of Rutter and Sir Michael Tippett. In June he directed the SUMMA MUSICA in a performance of Russian sacred music for the Perth Russian Festival and in early July conducted a choral concert of Vaughan Williams, Frank Martin and Murrill. He presented Mozart's Mass in C minor in November and the first Australian performance of Rautavaara's Vigilia in early December. For a three-concert series starting on Good Friday 2006 he prepared an edition of Alexander Utendal's historically significant Penitential Psalms published in 1570 from part books held in the Royal Danish Library. Four psalms performed on Good Friday and three psalms performed July 7. After travelling to Bolivia and spending time in the Archivo Nacional Boliviana in Sucre during 2006 Maydwell commenced the reconstruction of works from the Spanish colonial period. Good Friday 2007 saw the presentation by Summa Musica of two sets of lamentation settings of the works of Tomas Crecquillon and Johannis Gardani (first performance in modern times) found in a publication of settings by a number of composers from 1549. Both works have been re-edited by Anthony Maydwell from the 1956 thesis of Glen Watkins (the famous Gesualdo scholar) on Renaissance Polyphonic Lamentation settings. Towards the end of 2007 Maydwell presented Stravinsky's L'Histoire du Soldat as well as other chamber music, opera and orchestral harp playing in various concerts. In November he conducted Summa Musica in the first Australian performance of Bo Holten's Songs of Heaven and Hell (1995). In January 2008 Maydwell returned to the Archivo Nacional in Sucre, Bolivia and made a significant historical discovery of imprints from 1544 and 1598 in the bindings of 18th century Passion settings. These represent the earliest imprints in South America. He returned with hundreds of pages of manuscript in digitized form and has already begun the process of reconstruction. Some of the works completed were performed by Summa Musica in June and November 2008. His findings were published in Anuario 2008. Anthony Maydwell directed a performance of Cristobal de Morales' Lamentation setting (published posthumously in 1564) on Good Friday. In 2008 Maydwell also performed as harpist with such diverse performers as Paul Potts and Aled Jones to the Kiev Ballet. (Swan Lake and Sleeping Beauty). He also re-established the Exhibition Programme - a programme he had run previously for 15 years through the WA Academy of Performing Arts and the Australian Music Examinations Board - for gifted pre-tertiary music students through the University of Western Australia. The programme is now running independently on the campus of Trinity College, in East Perth. Maydwell's 2009 activities commenced with the first performance in modern times of one of eight Passion settings by the Bolivian composers Manuel Mesa y Carizzo and Juan de Araujo (it is not always clear whose work is whose) - the setting of the Passion according to St John performed in La Plata in the years 1767-1773. The same concert saw the first Australian performance of Brazilian Classical period composer José Maurizio Nunes Garcia's Miserere from 1798. In June he returned to Bolivia to present a paper to the Congreso V of the Asociación de Estudios Bolivianos on his methodologies in uncovering lost imprints, reconstructing works found in the archive and presented for discussion of the potential for the regular performance of colonial repertoire in Bolivia. Later in 2009 Maydwell played harp for the Australian Ballet's performances of Swan Lake and presented a concert of Bolivian repertoire with Summa Musica as well as the Nine Lessons and Carols at Trinity Church, Perth. 2010 commenced with performances with the WA Philharmonic Orchestra and the reconstruction and performance of Pedro Ximenes Abril y Tirado's Passion according to St Luke for Good Friday and the first performance in modern times of the Renaissance composer, Estevao Brito's Lamentation settings. 2011 Maydwell revisited Victoria's Responses for Tenebrae with Summa Musica reconstructed and performed a lamentation setting for two trebles and harp from Bolivia, reconstructed and directed the complete Il Lauro Secco published in Ferrara in 1572. He also edited the complete Welsh Harper of 1830 - a monumental project of 450 pages of solo harp repertoire. 2012 Maydwell directed Summa Musica at the National Orff-Schulwerk Conference, played harp with Il Divo for the Festival of Perth, the WASO's EChO series and the WASO's Composers' series. He directed Summa Music at the Fremantle Arts Centre and Seton College and conducted a performance of Gesualdo's Miserere and performed settings of the Pange Lingua by Antonio de Cabezon from 1550 from his own transcriptions upon the Arpa Doppia. He performed for the Jubilee of the parish of St Cecilia in Floreat. Of a more academic bent he delivered the Advanced Music Skills unit at WAAPA and completed a new edition from the 1613 print held in the State Library of Bologna of Gesualdo's 6th book of Madrigals to be performed by Summa Musica later in 2013. He established a new ensemble for boys with changing voices, Concentus Musicus Perth which gave its premiere performance at the end of 2011. Most recently, he played harp for the Perth Symphony in recordings of the works of Carlo Gandofia and the new opera Pecan Summer. During 2013 Maydwell completed a reconstruction of Giammateo's music for Holy Week. Sabbato Sancto was performed on Good Friday by Summa Musica. He also reconstructed Heinrich Graun's Easter oratorio Der Tod Jesu and Carissimi's First and Second books of Motets. 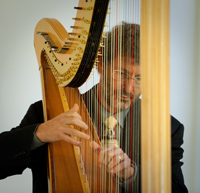 He has established the teaching of harp at Perth College and Trinity College. He has also started the Treetop children's choir in the Hills east of Perth. His involvement with both the Perth Symphony (South Pacific, Symphony by the Lake), WA Philharmonic (Nutcracker Ballet), and WASO (Eugene Onegin, ECho and Attar/Westlake Compassion) continues. In the last couple of years Maydwell has completed a number of monumental projects. Michael Praetorius' Musarum Sionar collection of 52 motets (over 900 pages of choral score) and Paulo Fararese's Music for Holy Week (over 400 pages). Anthony Maydwell is also an editor of choral music, a computer engraver using the Score, Sibelius, and new Dorico interfaces. He is an occasional speaker for arts and community organisations such as Alliance Française, the Goethe Institute, Musica Viva, Rotary International, the Western Australian Symphony Orchestra, University of the Third Age and the University of WA's Centre for Medieval and Early Modern Studies.